One of the strangest success stories in Canadian pop culture history, `The Hilarious House of Frightenstein,`starring Billy Van, was made at CHCH-11 in Hamilton, ON and forty five years later is still an international cult favorite. When growing up in the 1980’s, you had to get up really early to watch The Hilarious House of Frightenstein. I mean, you needed to get up before the sun was even up, creep downstairs as quietly as possible so you didn’t wake your parents, and turn the TV on way down low. You sat real close to the TV, with a bowl of cereal on your lap and a blanket clutched tight just in case you got to creeped out and had to cover your head with it. But, man, the payoff was really sweet. There was nothing quite like Frightenstein. Just the opening title sequence was enough to blow my eight year old mind. 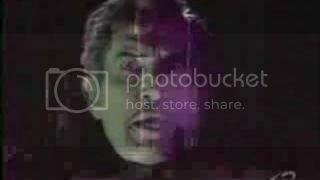 Shot in pinks and purple psychedelic hues, the face of Vincent Price, tinted green, was superimposed over a desolate landscape and crashing lightening as he recited his creepy poem: “Another lovely day begins, for ghosts and ghouls with greenish skin. So close your eyes and you will find that you’ve arrived in Frightenstein. Perhaps the Count will find a way to make his monster work to-day. For if he solves this monster-mania, he can return to Transylvania! So welcome where the sun won’t shine, to the castle of Count Frightenstein!” And then there was that laugh. That classic creepy Vincent Price laugh. Oh man. It was almost too much to take. My head was already under the blanket. I was completely turned on by tuning into The Hilarious House of Frightenstein. 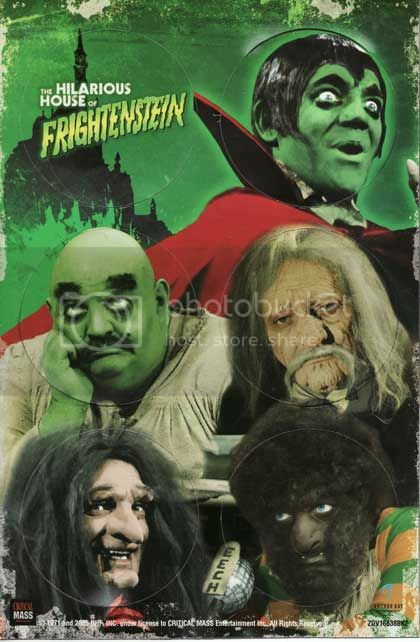 Strange as it may seem, horror icon Vincent Price came to Canada to film narration scenes for `The Hilarious House of Frightenstein.` Four days of work was spread over 113 episodes. His eerie narration was sometimes a little to intense for kiddie TV, but it was pop culture gold! But I wasn’t alone. Possibly the most successful small studio television production in the history of Canadian broadcasting, for over forty years The Hilarious House of Frightenstein has maintained a massive cult following across North America. It is a television success story as strange and captivating as the colourful characters that inhabit Castle Frightenstein itself. In 1971 brothers Riff and Mitch Markowitz, producers at CHCH-11 in Hamilton, Ontario, keyed in on a crazy idea. What about a sketch comedy series for kids featuring the classic Universal Horror monsters? There’d be a goofy vampire, his Igor type sidekick, a witch, a werewolf and other odd beings that would entertain and, once in a while, teach kids in a zany and offbeat production. Getting their writer friends together for a feast of wine and spaghetti, the group came up with a story about Count Von Frightenstein, a son of Dracula, who was banished by his father to a castle in rural Canada with his bumbling sidekick Igor where he tried, and failed, each week to bring their Frankenstein type monster, Brucie, to life. An original idea, the brothers quickly put together a cast featuring the giant sized Fishka Rais as Igor, little person Guy Big as the Mini Count and, the star of the series, Billy Van as pretty much everybody else. A master comedian and impersonator, Van took on the role of The Count, Grizelda the Witch, the record spinning Wolfman, The Librarian, The Oracle, Bwana Clyde Bailey the explorer, Dr. Pet Vet and a host of other odd ball characters. But sealing the deal with CHCH-11, which was taking a big risk at producing such an unconventional program, was the addition of horror icon Vincent Price, who acted as host and storyteller, to the eerie kids show. Filled with improvisation, psychedelics, rock n’ roll, puppets, scattered adult humor and even a little bit of educational value thrown in, there was nothing like The Hilarious House of Frightenstein before, or ever again. The series became an instant hit in Canada, and quickly found an audience in the United States. A small show from a local broadcaster in Canada making syndication in the US is almost never heard of, but Frightenstein’s clever humor and memorable characters made it an instant favorite. One of the last surviving members of the `Frightenstein`team, producer and screenwriter Mitch Markowitz is holding the torch by meeting fans of the cult series at autograph shows and comic conventions across North America. Over four decades later The Hilarious House of Frightenstein is still being shown on television across North America, although the majority of the people involved in the show are no longer with us. But one man, Mitch Markowitz, holds the torch as one of the last surviving members of the Frightenstein team. Co-creator and producer of the series, Markowitz also appeared on screen as one of the show’s more obscure characters, Super Hippie. The Hilarious House of Frightenstein remains to be one of Mitch Markowitz’s favorite projects. Traveling to autograph shows and comic conventions throughout Canada and the US, Markowitz regularly meets with fans of the show, sharing his memories and listening to theirs. 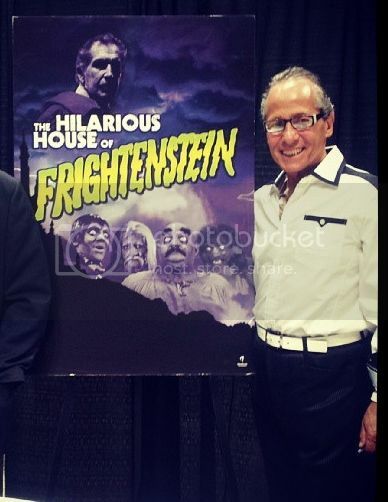 It was at the Hamilton Comic Convention that I had the great pleasure to talk to Mitch Markowitz about his Frightenstein memories. One of my favorite shows growing up as a youngster, it was amazing how the memories of the series flooded back to me as I had a lively conversation with one of the last men standing who helped build Castle Frightenston. Sam Tweedle is a writer and pop culture addict who has been entertaining and educating fans of the pop culture journey for a decade. His writing has been featured in The National Post, CNN.com, and Filmfax magazine. The Pop Culture Addict and Friends! Visit the gallery to see more photos of Sam Tweedle and his close encounters! Speed Racer: Go Wachowskis, Go! Unless your name is Sam, this isn’t for you.